IBF, WBA, WBO, IBO and “The Ring Magazine” World Heavyweight Champion Wladimir Klitschko and his Australian contender Alex Leapai stepped on the scales today. 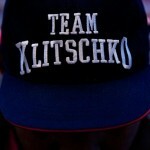 The fight will be shown live on RTL in Germany. ESPN will show the fight in the US. 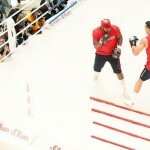 Wladimir Klitschko and Alex Leapai held their open workout at the Centro shopping centre in Oberhausen (Germany). 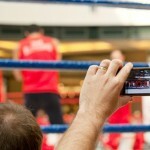 About 3000 fans showed up to watch both fighters showing off their boxing skills in preparation for their heavyweight championship fight this Saturday, April 26. IBF, WBA, WBO, IBO and “Ring Magazine” Champion Klitschko and his contender Alex Leapai will face off at the König-Pilsener-Arena Oberhausen, Germany. 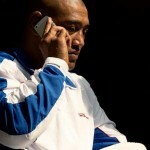 Remaining tickets for the fight night are available on www.eventim.de and via phone under +49-18190-121314.